Alex Perry's dresses always have that timeless, striking elegance and at the RAFW 2011 catwalk collection proved no different. Gorgeous reds, greens blues and orange were juxtaposed with dominant black and those signature Alex Perry tailored sleek lines in his Cuban collection. The collection was paired with sleek and understated hairstyles to allow the gorgeous designs, intricate necklines and sumptuous fabrics to do the talking. To capture this enduring sophisticated look at home, it is best to start with hair that is not freshly washed for this look, as the natural oils of your hair will help to hold the style. Start by brushing hair all back off your face with a paddle brush. 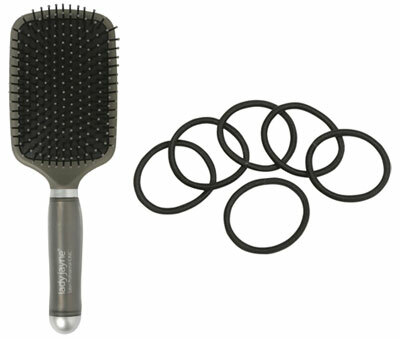 Once hair is all brushed back, use the paddle brush to ease hair into a ponytail that is level with your eye-line. Secure ponytail with a thick snagless elastic, in the same colour as your hair for a seamless look. To eliminate any wispy pieces of hair on the underside of your ponytail, slide a few bobby pins in. Give hair a good spray with hair spray to set the style. Available nationally from: Pharmacies, Kmart, Target, Priceline and Big W.